They were all reported after the latest scandal. 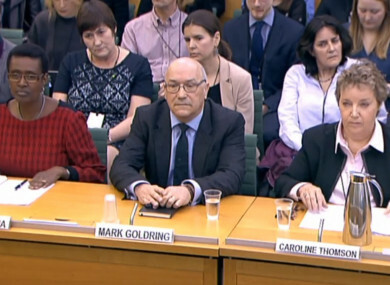 Winnie Byanyima, executive director of Oxfam International, Mark Goldring, CEO of Oxfam GB, and Caroline Thomson, chair of trustees for Oxfam GB, giving evidence before the Commons Development Committee in London. OXFAM SAID TODAY it was investigating 26 new cases of sexual misconduct which had been reported since a scandal broke earlier this month over its handling of a 2011 case in Haiti. The British charity’s chief executive Mark Goldring told a parliamentary committee in London that 16 of the cases related to its international operation. “There are 26 cases that have come forward… They range in time frame from more recent events to long historic events where people did not report them at the time,” Goldring said. “We really want people to come forward,” he added. Goldring apologised “wholeheartedly” on behalf of Oxfam to the committee, which said it would conduct its own inquiry into abuses in the foreign aid sector. The chief executive said safeguards had been put in place following an internal investigation in 2011 into the behaviour of some Oxfam staff in Haiti but admitted that the charity had not gone far enough. Last week, Oxfam unveiled an action plan to tackle sexual harassment and abuse, including creating a new vetting system for staff. The charity formally apologised to Haiti on Monday over the prostitution scandal rocking the aid charity. It expressed its “shame” and vowed to do better as it handed over a damning internal report into the allegations. Made public earlier in the day, Oxfam’s 2011 report into the behaviour of aid workers sent to Haiti revealed that three staff had physically threatened a witness in the prostitution investigation. Oxfam’s 2011 report, compiled in the year after aid workers were deployed to Haiti, revealed that seven staff were accused of using prostitutes at an Oxfam-funded residence. Four staff were fired for gross misconduct and three others, including then country director Roland Van Hauwermeiren, were allowed to quit. Email “Oxfam investigating 26 new cases of sexual misconduct”. Feedback on “Oxfam investigating 26 new cases of sexual misconduct”.